I am a girl who loves her dresses, blouses, heels, wedges, etc. Let’s be realistic though, sometimes you don’t feel like getting all dolled up to run some errands. A trip to the grocery store and swinging by the pet store for some Ruby treats, a dress & heels why no thank you! 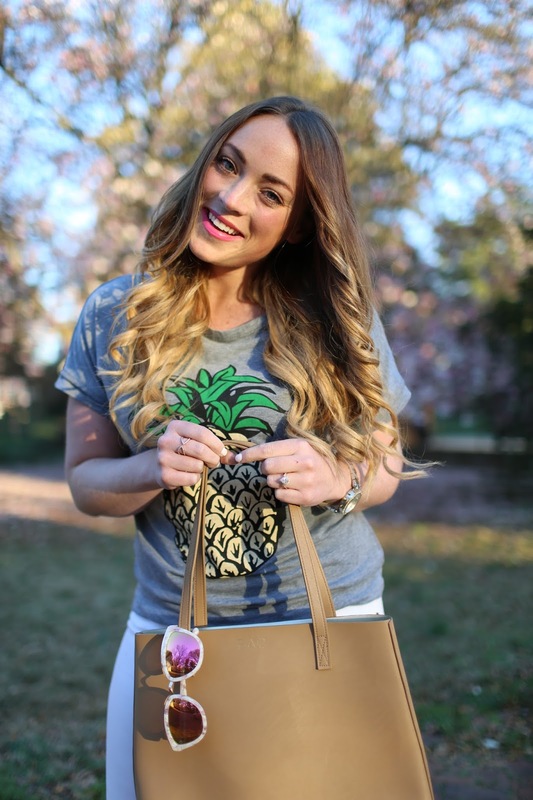 Enter here this cute, adorable pineapple tee that is $11! I love styling a fun graphic tee with my favorite pair of jeans and my beloved Toms. These shoes are by far one of the most comfortable pairs I own. I have a few pair of Toms as they are so easy to throw on and go! Romwe, similar to SheIn in which you just have to watch sizing. I size up a full size in almost everything because I don’t want anything tight or too short. Otherwise, I have had great success in finding trendy pieces at such an affordable price! I usually receive the package in ten days so plan ahead accordingly! Half way through the work week! Woot, woot!